In this great deal Le smartphone company comes with 1 rs sale where they offers le 2 smartphone at just rs.1 for first 300 Units. Registration starts on 15th June at 12PM. This offer is only available to residents of India of the age of 18 years or over. 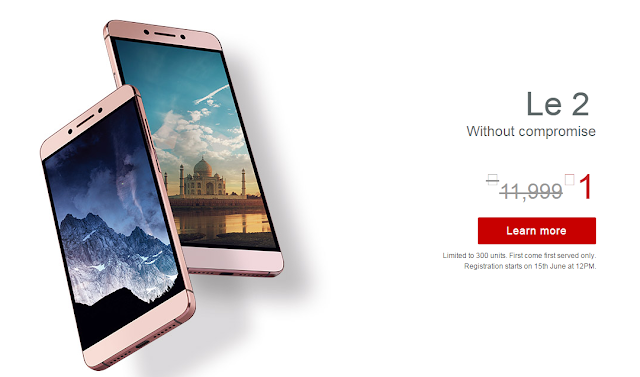 This offer cannot be clubbed with other sales, promotions, discounts, coupons and/or promotions offered by LeEco. This offer is valid till stocks last and the devices will be available for purchase on the Website (optional: insert link) during such period as is communicated to you from time to time through emails/other notifications. Only one device is permitted per customer under this offer. LeEco reserves the absolute right to modify or withdraw this offer at any time and its decision shall be final and binding. 3. Limited to 300 units. First come first served only. 4. Registration starts on 15th June at 12PM. Enjoy the Great Deal and keep sharing this post with friends & relatives so that all can grab this loot offer. To Get Latest tricks and offers on your WhatsApp Account Save this Number 07041465497 as "TTC" and send Message "JOIN YOUR NAME"